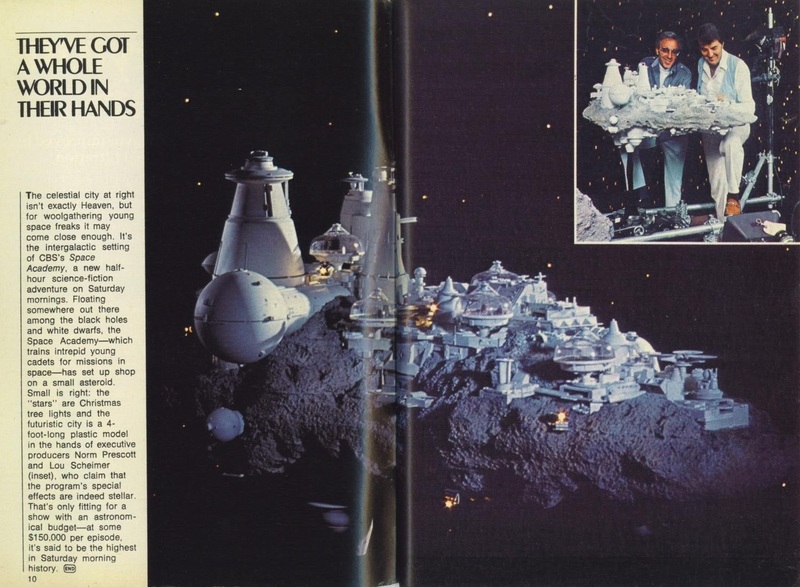 Even though Space Academy didn’t air until September 1977, the idea was conceived in 1969 by Filmation’s Allen Ducovny, and development deals had been in the works with CBS since 1974. Originally, the idea was pitched to Gene Roddenberry as the basis for Star Trek: The Animated Series (1973-1974). According to Filmation chair Norm Prescott, Roddenberry rejected the idea, despite being offered a large sum of money. Filmation did end up producing the animated Star Trek—“the first attempt to do an adult show in animation,” Prescott gushed in 1973—with Roddenberry maintaining creative control. When Space Academy premiered, everyone assumed it was chasing the success of Star Wars. It wasn’t, and Lou Scheimer was quick to quell the notion. The cadets in space acting as the “Peace Corps of the future,” as Scheimer described the show, was a descendant of Star Trek and Robert Heinlein’s novel Space Cadet (1948), as well as TV’s Tom Corbett, Space Cadet, on which Allen Ducovny had worked as a producer in the 1950s. At the time, Space Academy had the biggest budget in Saturday morning history. One of the great sci-fi miniatures from a show I did not miss. Interesting that Space Academy is reported in the blurb to be the most expensive show “in Saturday morning history” at $150,000 an episode. The young cadets in space theme was originally pitched by Filmation as the premise for Star Trek: The Animated Series. Rodenberry rejected it, and Scheimer and Prescott went ahead and created a new show. Chuck Comisky was visual effects supervisor, and John Frazier, who won an Academy Award in 2005 for his work on Sam Raimi’s Spider-Man 2, was special effects supervisor. Space Academy spun-off as Jason of Star Command in 1978.